Trust Him, with ALL your heart. 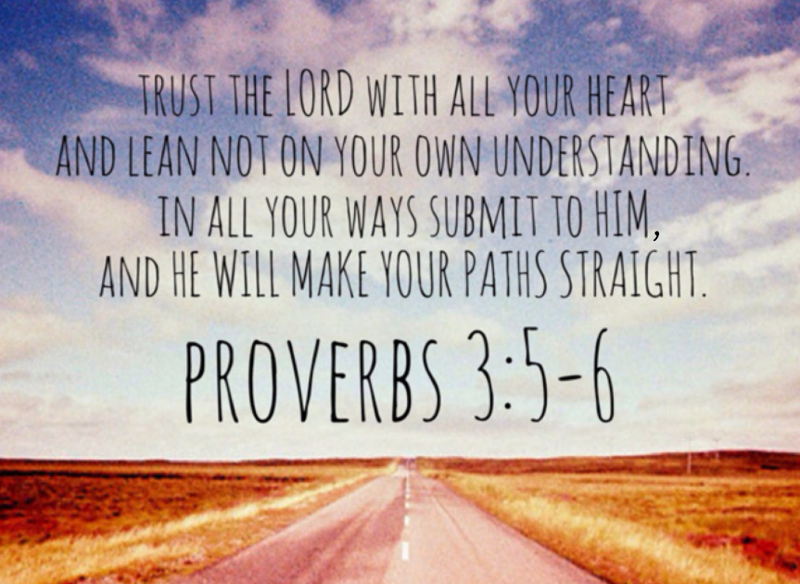 Trust Him, and do not lean on your own understanding. Believe in the reliability, the truth, the ability, and the strength of Him. I've been thinking about these words a lot lately. How difficult it is for me to surrender the idea of leaning upon my own understanding. To prevent myself from defaulting into my own selfish way of thinking... MY way, if you will! But, MY way is simply not the place I should rest assured or feel definitive. MY way is not really secure or in control. No... truth be told, MY way is not something to be trusted. It leads me into stress. It causes me confusion, sorrow, restlessness, anger. In fact, MY way is the farthest place my heart should seek rest. MY way is the most ridiculous place to put trust. But how weird and contradictory does that seem? I trust me more than anyone, right? I've learned from my own personal experience. I perceive. I study. I make decisions with what I know to be a sound mind. But is that actually wise or good for me? Am I walking in real wisdom when I go at it alone? God says, "No... Don't do it. Don't trust yourself. Don't loose sight of my glory. Don't stray away from my perfect truth. Rather, acknowledge me in everything. Obey my Word and know my promises. Look for me everywhere. Abide in my grace and give me the task of taking on your well-being. Really, I've got this! Believe in me and only ME!" Yes, only in His Way is there wisdom. Only with Him as my focus, can I have a beneficial direction... a proven path.. a meaningful purpose... a blessed hope. Why trust Him with all our heart? Why give up our rationale and what we think may be right vs. submitting to what He commands to be holy? Because He has a plan in hand and is ready to see us through to completion. Because He loves us most. Because HE IS GOD and well, we are not. With this in mind, today I encourage everyone reading this little blog to stop and read all of Proverbs Chapter 3. And as you invest in receiving God's Word, consider the importance of trusting and seeking after His healthy wisdom. Stop and look around at all the ways there are to acknowledge His glory in your life while loving others in His Name. Surrender your understanding and logic over to His care. Abide in His grace. Why? Because God's Way is the only reliable path to cling to. God's Way insures and promises peace, health, favor, refreshment.